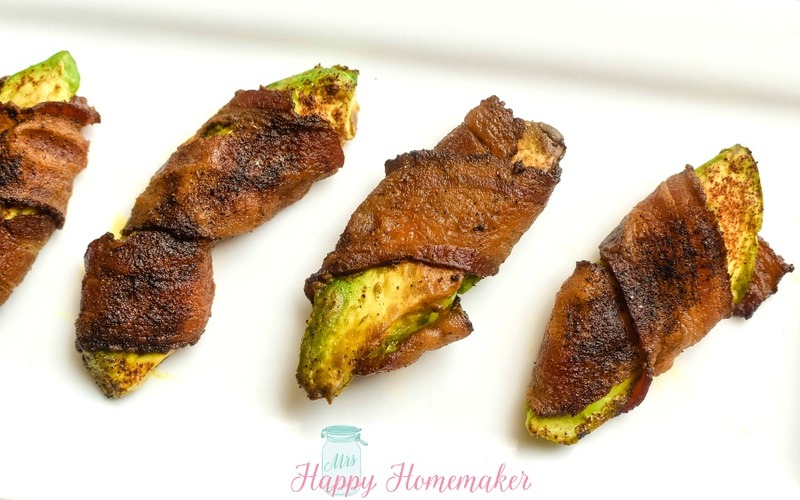 These Bacon Wrapped Avocado Slices aren’t just incredibly easy, but they are delish! Low carb and fabulous. I used to not really care for avocado unless it was made up into a pretty chunky style guacamole with lots of other flavors going on to balance it out. Over the years, I’ve really started to like it though and find myself eating it a lot. When I did my first Whole30 last year, I starting adding it to a variety of dishes to jazz it up a bit and I quickly developed a newfound fondness for it. However, it can’t be too ripe – I can’t stand an avocado that’s to ripe. It’s not the flavor, it’s the texture. It’s just… well, slimy. I like mine when it’s just become ripe & still nice and firm. 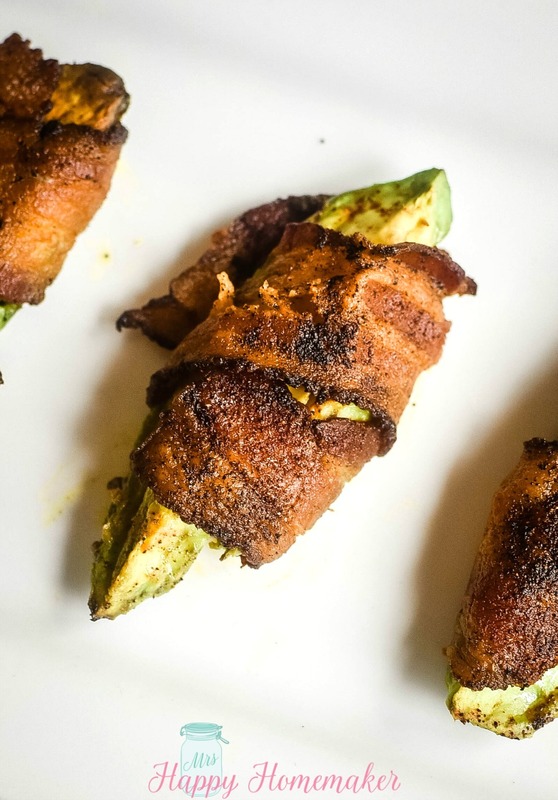 Having a ripe, but firm, avocado one of the keys to getting this Bacon Wrapped Avocado recipe right. And you definitely wanna get this recipe right because its quickly going to sing love songs to your avocado loving heart. If you don’t have an avocado loving heart, then you should probably reach out to Garth Brooks or Clint Black or someone and have them write you a sad country song about it. Just a suggestion. If you do this, I want a part in your music video. I could hold an avocado and cry. We could be famous. The other trick to getting these right is to par-cook the bacon. 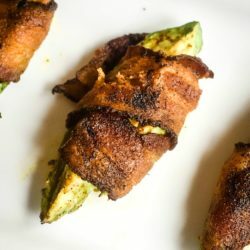 I’ve seen versions of this recipe online and they all say just to wrap the raw bacon around the avocado and bake it. But see, just like I don’t like my avocado mushy… I also don’t like my bacon mushy. So, in a skillet – cook it for a couple minutes on each side first & let it drain on a paper towel while it cools off to where you can handle it without burning yourself. Then after wrapping the avocado in the par-cooked bacon, you just sprinkle with with some chili powder (you NEED this chipotle chili powder in your life… it’s amazing stuff) & garlic powder… and bake it off til the bacon is all addictive crispy. With the Super Bowl coming up, place a platter of these out on the table and watch how fast they disappear. These make a delicious snack, appetizer, side, or even a light meal. I love a grilled cheese with my tomato soup, but I also REALLY LOVE these bacon wrapped avocados with a warm bowl of tomato soup. (If you need a good tomato soup recipe, this one is going to make you very happy). And for all you folks doing Whole30 or Paleo – these are totally friendly to both! Place on a parchment paper lined baking sheet & bake for 15-18 minutes, or until the bacon has reached the level of crispiness that you want. Sprinkle with a smidgen of salt. Not much salt as the bacon is salty on it’s own, but it needs just a little. Let cool slightly and serve with ranch, if desired.